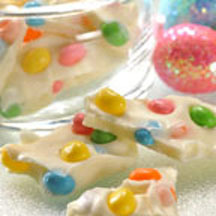 Making a fun, yummy Easter treat just doesn't get any easier than this! Makes a lovely gift, too! Microwave morsels and vegetable shortening in medium, uncovered, microwave-safe bowl on MEDIUM-HIGH (70%) power for 1 minute; STIR. Morsels may retain some of their original shape. If necessary, microwave at additional 10 to 15-second intervals, stirring just until morsels are melted. Stir in 1/4 cup SweeTarts Jelly Beans. Makes 1 pound of bark.